As California struggles to close a stubborn achievement gap for its English learners, integrating math education with English language development can be a key to unlocking their potential, a new study says. The Education Trust—West report, Unlocking Learning II: Math as a Lever for English Learner Equity, highlights school districts — including three in the Greater Los Angeles area — that are getting English learners proficient in math while they are still mastering English proficiency. “The old mindset is you needed to make sure English learners just get to English proficiency first, then you can expose them to more academic learning, like math and science. But the new shift is you can do both simultaneously, and it’s a mutually beneficial exercise for developing English proficiency and content learning,” said Rachel Ruffalo, senior practice associate at Ed Trust—West and lead author of the report, which was released Thursday. structuring opportunities for English learners to engage in rigorous math discussions. Steps like these are closing the wide and persistent achievement gaps in math that have kept English learners lagging behind their English-proficient peers eight years after the adoption of the Common Core, says the report. Statewide, more than 1 in 5 students in K-12 schools are English learners. Yet math achievement levels among these students have remained considerably low. Last year, just 12 percent of English learners met or exceeded math standards on the California Assessment of Student Performance and Progress (CAASPP). San Francisco Unified was also identified as another bright spot in California, along with the Santa Clara Office of Education and Sun Empire Elementary School in the Central Valley. All are serving a significant number of English learners. LA Unified was not mentioned in the report. It is the largest school district in the state, and a quarter of all students are English learners. 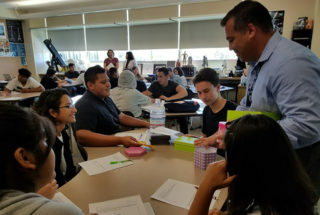 Alhambra Unified, serving 17,000 students, 22 percent of them English learners, has adopted an Integrated Math course for all high school students who are still mastering English. They are placed in math classes that are part of the A-G curriculum, a set of college-prep courses that are required for entrance into the state’s public universities. The district’s English learners reclassification rate in the 2016 school year was 14 percent, 1 percentage point higher than the state’s at 13 percent. The district — where 44 percent of students are English learners — provides all 550 of its teachers with professional development on how to integrate language development practices for English learners in every subject and grade level. The district’s EL math proficiency rates have increased annually since 2015, says the report. The district is running two dual-language programs: one in Vietnamese and one in Spanish, which alternate the language of instruction in math daily, so students are taught math in two languages, leveraging students’ home language skills. District officials say these programs improve cross-cultural relationships and strengthen partnerships between schools and families. In 2014, San Francisco Unified passed a math course sequence policy which allows all students to be placed in heterogeneous Common Core-aligned math classes, with support classes and A-G approved classes for English learners. The outcomes have been positive. In 2017, 29 percent of 11th-grade English learners met or exceeded the standards in math — five times the statewide rate. This outcome reflects a 6 percentage point increase over the last two years, the report says. Nogales High School, one of 19 Rowland Unified schools, models a welcoming environment for all students and has a counselor dedicated to supporting newcomer students and English learners. “In recent years, California has enacted several policy changes that are really good for English learners, but now it is time to put some urgency into implementing them in a very deliberate way. We’re on the right track, but we need to speed up the pace,” Ruffalo said. “There are new policy opportunities in California” that can help English learners, she noted, including the targeted funding under Gov. Jerry Brown’s Local Control Funding Formula, the passage of Proposition 58 which allowed students to be taught in languages other than English, and the state’s new English Learner Roadmap. Adopting and/or developing instructional materials such as language-rich collaborative math tasks. Facilitating structured opportunities for ELD and math coaches and specialists to work together across schools and districts to support teachers and integrate ELD into the math curriculum. Reducing tracking in math classes and providing open access to advanced courses with appropriate language supports for ELs.